There is widespread acknowledgment that engineers need to understand how engineering practice, especially when it utilizes new or emerging technology, encounters ethically challenging situations. Engineers today, perhaps more than in the past, find that engineering decisions must, in addition to technical and social/economic considerations, must include ethical judgements. Few are likely to challenge the proposition that engineering education should include instruction in ethics. In an already crowded curriculum what specific topics should be included, in what part of the program should ethics be added, and how and by whom should it be taught? These topics were addressed in a Seminar/Workshop on PROFESSIONAL CAPACITY BUILDING for the Engineering Educator of the 21st Century held at Beihang University, 9 - 14 July 2018. You can link to PDF versions of PowerPoint slides I prepared for this seminar. 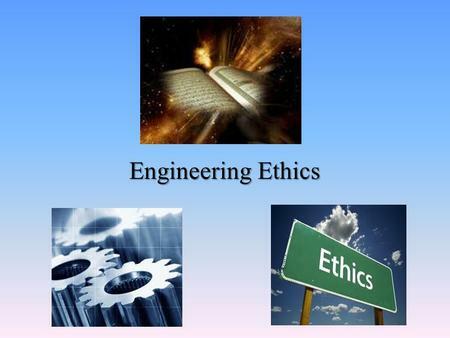 I have prepared five video lectures on teaching engineering ethics which discuss in more detail the topics on these slides. The video lectures are available on YouTube and can be accessed by following the links below.